I can’t think of any other drink that says summertime better than lemonade. A homemade pitcher of lemonade is so much better than that powdered stuff you get out of a can. Don’t get me wrong, we use plenty of that, but sometimes you just need the real deal. This combines two of summer’s best flavors! You might also want to check out our Perfect Glass of Lemonade and Raspberry Lemonade. In a small saucepan bring the 1½ cups sugar and 1½ cups water to a boil. Whisk to dissolve sugar, making a simple syrup. In a large pitcher combine the cooled simple syrup with the lemon juice. Add the remaining 3 cups of water to the pitcher. 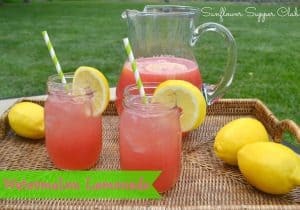 Taste lemonade and add more lemon juice or sugar if desired. Place in fridge and let chill. When ready to serve, stir in the watermelon puree into the pitcher. I love lemonade! I’ve never tried watermelon though. Will be trying it soon!! This looks so refreshing. I’m sharing this on my FB page tomorrow and I’ve pinned it. I love this idea of pureed watermelon in a drink! Pinning and sharing! This sounds wonderful. I make a watermelon drink with crystal light green tea mix but this would be great with fresh lemons. Will have to give it a try. Pinning it. Thanks for sharing on Foodie Friends Friday and I hope that you come back and join us next week.